One method of controlling the flow of water into water tanks and cisterns is the use of ball valves. Simply, a ‘ball’ floating on the water inside the tank/cistern moves an arm attached to the valve which controls the input of water – as the ball/arm falls, the valve is opened to allow water into the tank, then as the water level rises, so does the ball and arm closing off the valve. Note that although referred to here as a ‘ball’, the float can be any shape – non-spherical floats will be found in narrow cisterns where space is limited. On other systems there is a hinge in the arm between the valve and the ball with a lock nut and adjustment screw – to adjust just loosen off the lock nut and adjust the hinge to bend the hinge. In the past, the outlet from slide valves were often fitted with a ‘silent feed’ pipe (a short pipe from the valve down into the water in the cistern/tank). As the water was fed from the valve into the cistern/tank below the water level, there was reduced noise of water filling the tank. These pipes are now banned (due to the risk of water being drawn back from the tank in the event of mains pressure failure) and if fitted, these pipes should be removed and discarded. Wear in these valves are not normally a problem, the valve washer may need replacement, especially if the supply water contains muck etc. Other than that, there’s not much else to go wrong. 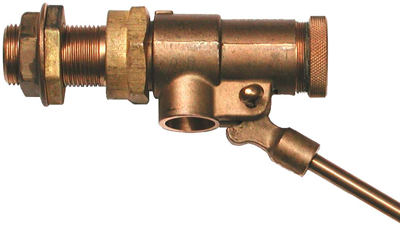 The diaphragm valve operates with an arm from the float as for the slide valve but in this case a screw adjuster on the top of the arm pushes against a ‘plunger’ which pushes the diaphragm against the supply valve nozzle. One ‘reputed’ advantage of the diaphragm valve is that the only moving part which is in contact with the water is the diaphragm itself, and that this reduces problems in hard water areas where deposit build-up and corrosion can occur. Like with the slide valve, in the past, the outlet from diaphragm valves were often fitted with a ‘silent feed’ pipe so that the water was fed from the valve into the storage tank below the water level; these pipes are now banned (due to the risk of water being drawn back from the tank in the event of mains pressure failure) and, if fitted, should be removed and discarded.